The earth is the source of all things and nature is the environment in which you and I live. The way of benefiting the earth is without borders. Contries should live in harmony with each other and contribute to the earth's resource.Our Business is borderless, and we will improve the public welfare of the world's natural environment, practice it and spread it to all parts of the world so that everything on earth can be used. As an Environmental Educational Information Platform, EnvGuide is supported by the U.S. Department of Commerce, the U.S. Environmental Protection Agency, ITRC, ASTM, and operated by the US-China Environmental Educational Foundation. This platform is designed to provide experience and knowledge for both the public and environmental professionals. Supported by the US Environmental Protection Agency (USEPA), the US State Environmental Management Association's Technology Branch (ITRC), the US Department of Commerce's International Trade Administration (ITA), and the ASTM International Standards Organization (ASTM), the US-China Environmental Education Fund ( UCEEF) development execution. In the ability to reserve technology, we are constantly seeking progress. We combine the best resources of China and the United States, to organize and build a diversified technical database covering all directions. UCEEF cooperates with authoritative organizations, companies and institutions from both China and the United States to gether resources and build a platform to promote the development of environmental awareness in the world. We aim to combine advanced technology products and excellent scientific research results to establish a platform system for sharing resources and helping each other. UCEEF has built a resource sharing platform through close cooperation with authoritative governments and related institutions in the United States. With the deteriorating global environment and ecological damage, the U.S.-China Environmental Education Foundation aims to raise public awareness of environmental protection. UCEEF designs and produces related posters by regularly planning environmental awareness campaigns to encourage people to be attentive and involved. The environmental protection publicity film produced by the US-China Environmental Education Foundation (UCEEF) aims to guide the community to pay attention to groundwater pollution. Let us work together from the small things around us, starting with bit by bit environmental protection actions. 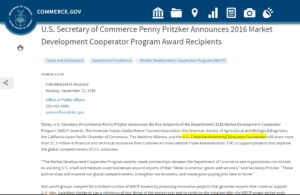 On September 12, 2016, U.S. Secretary of Commerce, Ms. Penny Pritzker, announced that the New Jersey-based U.S.- China Environmental Education Foundation (UCEEF) was one of five recipients selected by the US Department of Commerce's International Trade Administration (ITA) as part of the 2016 Market Development Cooperation Program (MDCP). To jointly promote and introduce US environmental protection related products and technologies to the Chinese public. Thank you for your interest in UCEEF! We strive to be active in our community and as we are constantly expanding, we invite you to connect with us. To be the first to learn more about what we do, arising opportunities, and how we can tackle challenges together, please complete your information. Once again, we look forward to connecting with you.